Get ready to celebrate bikes, create your teams and ride to work this May. With gas prices continuing to climb, it's a great time to be bike-curious. Talk to your friends and co-workers and create teams-or challenge each other to friendly competition. Seek out fellow riders at your work, school or neighborhood and learn routes, tips and tricks to get you to and from on two wheels. Our website is almost open as we get ready to kick off Columbus's 4th Annual Bike to Work Challenge this May. Check us out online and stay tuned for more details. If gasoline disappeared in a month, what would you do? Do you care? Do you have a plan? Our goal is to make sensible equipment to allow you and your bicycle to have a nice time together, at home and on the road. We have found bike touring that a healthy dose of minimalism combined with smart weight distribution and flexible cargo options makes for comfortable and fun riding day after day, week after week, riding solo or in a group. For that dose of minimalism, We have been inspired by the PCT thru-hikers and the amazing array of handmade and DIY gear that is to be found on the internet. The Bike Industry comes east with the Factory Demo Trailers from Niner, Giant, Felt, SRAM and Zipp all descending on Columbus for roll: bike camp! Ride the very latest and greatest available back to back. All in the same place, at the same time. Full Demo Fleets of Mountain and Road bikes, components, wheels and gear available to try and compare. Ride something different with organized group rides and clinics for road and mountain bikes for all levels. Then get geared up for the season special offers on all brands of bikes, clothing and gear, all weekend! Rides, bikes, bits, food, fun and friends. That's roll: bike camp. OK, so I saw this movie last year at the Banff Mountain Film Festival at the Wexner Center for the Arts about a guy who rode a tandem from Alaska to the tip of South America over a 2 year span and picked people up to ride the other half of the tandem with him. Well, this is the same guy. 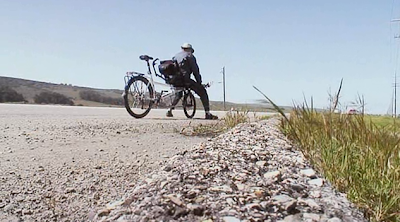 He was going to ride from San Francisco to New York with a senior who contracted cancer and couldn't make the trip on a specially built bike for two. 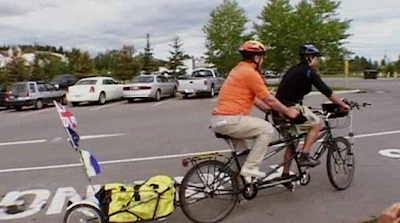 Instead, he's picking up people with disabilities to help him finish his ride. Watch the second episode of "Take a Seat," Dom Gill's documentary of his ride across the United States on a tandem bicycle. Watch the first episode of "Take a Seat," Dom Gill's documentary of his ride across the United States on a tandem bicycle. 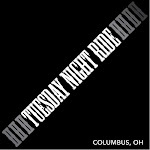 Columbus Public Service Bicycle Web Page is live! Remember: By law, bicyclists may move to the center of the lane to avoid road hazards or due to the narrowness of the lane. Bicyclists may change lanes when making a left turn, passing parked vehicles or slower moving vehicles and moving left out of a right turn-only lane to proceed straight through an intersection. Are we witnessing the start of a national backlash against bikes? 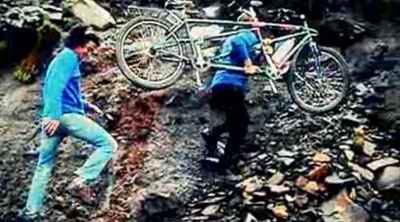 Until recently, everyone seemed to love biking. Cities from Long Beach to Omaha to Greenville, South Carolina, implemented ambitious plans to build new biking facilities. The federal transportation bills of 1991, 1998 and 2005 continually expanded funding to improve biking and walking conditions across the U.S, enjoying widespread support in Congress and from Presidents George H.W. Bush, Bill Clinton and George W. Bush. But now bikes are coming under fire from certain quarters. New York’s extensive network of new bike lanes, which doubled the number of bicyclists in the city and reduced traffic accidents to their lowest level in a century, is now the center of intense controversy. Anthony D. Weiner, a Democratic Congressman from Queens who’s eyeing a run for mayor in 2013, vows that if elected, he’ll tear out bike lanes across the city. Even in Portland, long a bike bastion, the city council is feeling heat after passing a $600 million measure to triple the city’s network of bikeways over the next 20 years. Some critics think that’s too much money for bikes when the economy is still struggling. And on Capitol Hill, some members of the House of Representatives think that cutting bike and pedestrian programs back to zero will make a difference in shrinking the budget deficits. "Roll on/roll off" train service for riders using the bicycle trails between Pittsburgh and Washington, D.C., is coming. The question is exactly when. The Allegheny Trail Alliance, a coalition of rails-to-trails support organizations, hopes service can begin as early as spring. Supporters want it to be available at all Amtrak stops along the passenger railroad's Capitol Limited route between the two cities. satisfy the most discerning rider. Velocity rims are sure getting around. Editor's note: These would look great with mocha colored Chris King hubs.